Kate Welham 1, Lawrence Shaw 2, Mark Dover3, Harry Manley4, Mike Parker Pearson5, Josh Pollard6, Colin Richards7, Julian Thomas8, Chris Tilley9. This article focuses on the use of Google Earth as a tool to facilitate public engagement and dissemination of data. It examines a case study based around one of the largest archaeological investigations of the Stonehenge landscape, the Stonehenge Riverside Project. A bespoke layer for Google Earth was developed to communicate the discoveries of the research by creating an engaging, interactive and informative multimedia application that could be viewed by users across the world. 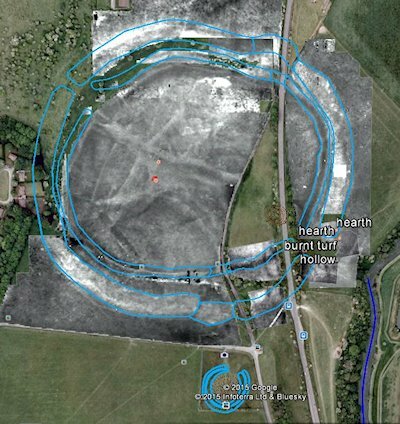 The article describes the creation of the layer: Google Under-the-Earth: Seeing Beneath Stonehenge, and the public uptake and response to this. The project was supported by a Google Research Award, and working alongside Google enabled a 'free to download' platform for users to view the data within in the form of Google Earth, as well as the integration of a variety of applications including: Google SketchUp, YouTube, and Flickr. In addition, the integration of specialist software, such as Esri ArcGIS, was fundamental to the integration of the spatial data gathered by the project. Methodologies used to create the application are documented here, including how different outputs were integrated such as geophysical survey, 3D reconstructions and landscape tours. The future possibilities for utilising Google Earth for public engagement and understanding in the discipline are examined. Key Words: Google Earth; Archaeology; Virtual Globe; Web GIS; Public Engagement; Stonehenge Riverside Project; Survey; Spatial Data; Seeing Beneath Stonehenge; Landscape; Excavations; 3D Reconstructions; Open Source. This research was supported by a Google Faculty Research Award. The funding to enable open access publication was provided by Bournemouth University.